I am always amazed at the quality of work and talent on display in this forum, and it has inspired me to try my hand at tailoring an edit to my own tastes, what will be my first fan edit. For The Last Jedi, I had a reaction similar to Hal 9000’s, and his Legendary edit is the most in line with what I want to see. It smoothly trimmed Canto Bight and was conservative with regards to cutting humor, along with a host of changes and tweaks I had never even considered that drastically improve the pacing. My favorite edit is moving the Yoda scene to just before Crait, making it the end of the 2nd act. It hammers home the lesson that failure is a teacher at the perfect moment. However, for me there are a few scenes I still have trouble watching, scenes that take me out of the movie every time: Leia’s spacewalk, Finn vs. Phasma, BB8 piloting the imperial walker, and Rose’s “rescue” of Finn. I don’t want to be a curmudgeon, and I realize that Star Wars is lighthearted fun, but these scenes broke my suspension of disbelief and disengaged me from the story. So, with permission, I am using Hal’s edit as a base, and making a few additional changes, outlined below. RELEASED! The final runtime is 140 minutes (credits roll at 132). Please PM me for more info. This was the scene that sucked me out of the movie (no pun intended). I don’t have a problem with Leia using the force, but this moment felt like a deus ex machina that cheapened the stakes. 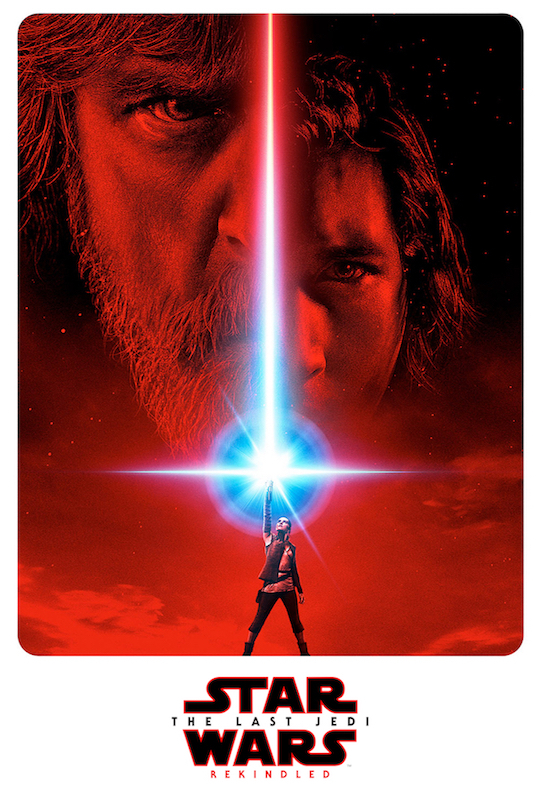 In a movie that introduces a lot of new ideas about the power of the force, this one just didn’t work for me. While the ship is crumbling around them, we pause for a boss battle between Finn and Phasma. It just didn’t feel necessary and hurt the pacing. BB-8 commandeering an imperial walker looked plain silly to me, so that whole scene was cut. Now we go from Finn and Rose running towards the shuttle to the shuttle flying out of the ship. BB-8 was rotoscoped into these shots so we understand he got on board as well. The deleted shuttle scene of Finn and Rose heading back “where we belong” was restored here as well. Not only does it give more resolution to Finn and Rose’s now-trimmed escape, it’s also a callback to the restored deleted scene when Poe gives Finn his jacket. Finn yells “Rose” over the radio during a reaction shot from Poe, cut to Finn flipping his headset up while looking distraught. This works for me because it adds motivation for Finn’s actions. The situation seems hopeless and he is desperate. Finn continues on towards the cannon. Rotoscoped Finn and Rose out of battering ram cannon firing and explosion. Added reaction shot of Kylo-Ren. Most fan edits have heavily trimmed this scene or even removed it, but I wanted to be even more conservative about it. For me, it either needs to be long or completely cut, because a heavily trimmed version makes the stalling tactic seem kind of pointless. In the theatrical version, it’s a stalling tactic and an extremely belabored joke. In the trimmed versions, it’s a Poe character moment that serves very little actual function. I’m hoping that by just removing the "mama” joke at the end, the stall tactic makes more sense and the joke is more tolerable. I don’t think this will be a popular take. It was just a little too drawn out and didn’t even look physically possible in the original cut. To me, this is not unlike Vader choking his lieutenants all throughout ESB. I agree it’s bad for morale and makes Hux into a floor mop, but it’s not unusual in Star Wars. Also, Hux delivers an important line: “We have them tied on the end of a string.” It’s a nice tease for the audience that the First Order is thinking a couple of moves ahead. I’ve seen many edits of this scene that work well, from darthrush’s saber drop, to Ivan Ortega’s radical alterations, but I wanted to opt for something simple that didn’t change the visuals (other than adding a bit of camera movement on a couple shots). It was apparent to me that the music is a big contributor to making the moment into a joke, with a music swell leading into long awkward silence. By adjusting the music, I think the scene no longer plays as a buildup to a joke, and instead emphasizes Luke’s anger/frustration. The look on Luke’s face while drinking was a bit off-putting and too strong coming from Luke Skywalker. I agree the purpose of the scene is to show Luke’s connection with the cycle of life (and Rey’s initial revulsion), but all of that is accomplished without Luke’s scowling look, which made it seem like he was enjoying making her uncomfortable rather than teaching her anything. It’s simply an awkward meet cute, and the dialogue here doesn’t bother me. This scene has a lot of issues but is critical to the plot. Even if the “labor dispute” is strange tonally, I thought at least we could remove Maz’s romantic pause about the codebreaker, which is awkward and unnecessary. I like the sexual tension, and don’t find it to be a joke at all, just character development. I liked how Hal removed the clunky “miniaturized death star tech” line, but while playing with this I found I liked Poe’s original line after. His response “A what now?” before Finn turns and says “It’ll crack that door open like an egg” does something important for me. It adds character and realism to both Poe and Finn. What used to be just exposition is now: A) Poe shocked at how seemingly endless the First Order’s technology is. B) Finn hears the question “A what now?” but rather than answering, he decides it’s more urgent to get to the bottom line. Blowing past the follow-up question, he bluntly warns everyone that the base is not safe. I like this shot, and while it may be a little “too good” on Rey’s part, it works for me as the Falcon’s entrance to Crait. This is one of the few moments of the film without dialogue, a scene that drew me in with just music and tone and I don’t want to trim it. Now that it’s no longer upended by Rose’s “rescue”, it has real impact for me. Made it appear as though Finn and Rose follow DJ out of the cell, briefly elude the guards, and the scene ends. Next time we see the trio, they are already in hyperspace (also removing the implication in the later scene that BB8 helped steal the ship). Since I’m building off of Hal 9000’s excellent Legendary edit, I felt it appropriate to include his special thanks to those who helped with his edit through feedback and work, as well as adding the names of those that helped with my own version. I also must thank my wife for sitting with me through several viewings, making valuable suggestions (how to fix “Space Leia” to name one example), and being patient with me throughout! Hey there I took a look at your clips and ideas. I just watched Hal’s version the other night with friends … which I better post on his thread after this! 2.) Finn, Phasma and BB8 - I understand people were a bit peeved that we get Phasma once again … at least this time she did something. As much as it would “make sense” for them to hurry up and leave, there is at least one Major continutiy issue and then there is the Finn character development (Literal fighting off his past and audibly joining the rebellion). The continuity issue is BB-8 … where is he? How is he in the shuttle? As much as I did not like the BB-8 Walker … I can’t see a clean way of doing this UNLESS someone with GOOD CG work can show BB-8 following them to the shuttle, even for a split second in the distance. If you can do that … then it could work. 3. )Rose’s Suicide Run - I do like the extended Finn flying in scene, as the audience you were really drawn in. I would be ok with that being put back in. However, there is a problem if Rose is not crashing into Finn. First of all, the collision scene clearly shows to ships crashing into each other. Second, why would later Finn be dragging in a unconscious Rose? Hal did a good job cleaning up that awful dialogue that helps it. Clearly, there is going to be some kind of interest between the two, so that also adds to the scene where Fin is watching over her while she was in the Falcon. 4.) Paige trimming - I can go either way with that. 5.) Hux’s Berating - Nah, leave that out ESPECIALLY if you are drawing out the Hux SNL - it’s too much berating on the character. THere’s enough of that in the movie later on too. I’d see Snoke doing something like that behind close doors not in public with Army Military Commander! 6.) Rose Talking - I like the triming Hal did. 7.) Rey and the Cowl - I can go either way. 8.) Kylo and the Desert - I can go either way too since clearly Snoke manipulated both of them so those statements cannot be 100% … as well as why would Kylo be so “truthful” as well when he is trying to manipulate ray. 9.) Rey’s triple kill! - I can go either way. Granted, we know Rey is THE Mary Sue. Fin’s Sacrifice - Yep, I think I would like that reinserted. There’s some good ideas here. Granted, some I personally do not agree with. My favorite is the Leia Poppins fix … that is done in such a way I like a lot! See, I’m the complete opposite. I was grinning ear to ear during the Leia scene. But it’s interesting to see people’s different perspectives on it. I think there is a way to make it worth for those who weren’t crazy about it. At least having it explains how Leia survives and literally everyone else on the bridge doesn’t, which is the cost of removing that moment. Regardless, cool seeing your own preferences poppasketti! While I don’t agree with all of them, I’ll try to think of ways to make some of your changes work. For Finn and Rose’s escape, maybe someone could insert a CG model of BB-8 into one of that just establishes that he’s back with them. Also, I don’t think removing the Finn/Phasma fight would take away from his character arc if you reinserted the deleted scene if Finn and Rose in the ship, where he declares there going back to where they belong. I think Finn came to this conclusion when he saw how doing nothing like DJ is only helping the bad guys win. By not choosing a side, you choose a side. Does Hal’s edit keep that scene of Finn and Rose flying to Crait? Can’t remember. I also think jarbear does bring up a good point about Finn’s Sacrifice and Rose’s involvement. You do end up with Rose strangely missing from the last few minutes of the film. I’ve mentioned these to darthrush on his thread, but there could be two other options to address this. One, you could have Rose be in one of the skimmers that gets shot by the AT-ATs during the approach, and have Finn scream “Rose!” over the comms when it happens. You could either have a heavily trimmed version of him reaching Rose in her crashed skimmer, or keep it out and assume he got her between when we see him get out of his own skimmer and him dragging her back into the base. Another option would be trying to lean into the theatrical version more and try to make her actions work. You could possibly move the moment when Rose looks at her necklace to later, where it makes it seem she is connecting her sister’s death with Finn’s potential death, which would drive her to want to stop him. It’d also be nice if it didn’t look like she turned out, but was still going towards the First Order to help explain how she reached Finn so fast. And possibly have the canon fire pretty quickly after they get knocked out of the way. Maybe these little changes, with some possible line cuts, could help make the moment work. Just some ideas, but I do think something should be considered to keep Rose being the one injured by the end of the film. Anyway, good luck to you poppasketti! Fortunately for me, the removal of the Space Leia scene still works that edited way. We don’t know how she survived, you can conclude via force, luck, combination of both. On top of that, when the crew gathers together after the events (can’t think of her name without looking it up) announces that Leia was the only one that survived in the bridge … so it wouldn’t conflict with anything since she didn’t mention her flying force powers or anything like that. For the Finn & Rose Shuttle, Hal did not include the shuttle deleted scene. That would work, but I too would need to rewatch that deleted scene to make sure it is a “completed” scene. Some deleted scenes looked like they were compelted, but there are some unfinished touch ups to make it not quite the finished product. The secret like you mentioned before, there HAS to be an inserted BB8 rolling around to make it work during the “run to the shuttle!” scene. I know I don’t have that skill! Yeah, I totally understand. I think that way is probably the best way to remove it, for sure. I would like to see someone try to make small changes that help make it work for others, though, possibly by adding a quick shot of the door with the sound of metal straining to imply she’s pulling on it with the Force, and also having only the music and no “swooshing” sounds when she starts flying back toward the ship. I honestly think it is that initial shot of her flying that throws people off. Possibly altering the shot itself or simply having music being the only sound in that shot could possibly help. But until then I guess just cutting it out will have to work for those who don’t like it. I feel like someone mentioned that something in that shot was incomplete, but I went back and watched it a few times and didn’t notice anything. I mean it is a really short scene anyway, so I doubt people would notice any tiny missing details like that. Yeah, I saw you suggest the same thing over in Hal’s thread! I think that would do the trick, it is just a matter of figuring out how to go about including it, what the best shot would be, etc. etc. Thank you for the replies and interest so far! Definitely some good feedback to consider. And yes, you may use any ideas you want for your edits! Obviously, I’m borrowing heavily from others myself. The Space Leia removal has a shot I tweaked in after effects, so let me know, and I can send you that scene in prores. I had considered adding the scene of Finn and Rose in the shuttle going back “where we belong”. It was not in Hal’s edit, but it is a nice moment to give that whole Finn / Rose adventure some closure and bonding time. It’s also a callback to the Finn / Poe added deleted scene. I will take another look at this! I would LOVE to add BB-8 somewhere in the shot of Finn and Rose running to the shuttle, even if far away. I would just need a good shot to roto him out of (and from a high angle moving away). Any ideas of a similar shot? Once roto’d, I think motion tracking him in should be relatively simple, considering how wide the shot is. I should mention I don’t have a problem with Phasma at all. I like the character, and love Gwendoline Christie, I just wish they used her in a more interesting and believable way. I actually wish Finn would have outwitted her instead of fight her, and, either way, not during evacuation time! I also didn’t need to see Finn fully commit to being “Rebel scum” in this manner; I prefer his commitment being shown by his actions on Crait. It’s not very obvious to me that you’re seeing two ships colliding, but maybe I can add a laser blast to help sell it. To me, it all happens so fast, and it’s great work by darthrush! Currently, this shot is cut, actually (updated first post so this is clear), so there’s nothing misleading, just missing: we don’t see Finn get back to base. We do see him survive the crash and run towards it, however. He next appears when Poe is figuring out Luke’s plan. I agree Rose is a bit missing in the end, and I like the idea of having her shot down at some point (and bringing back shot of Finn dragging Rose), but I think that might be too difficult to make it truly work. She would have to get shot down (using another crash shot? ), Finn screams (doable), and then Finn continues on anyway? What about his turning off his coms when Rose says “Don’t do this?” Do we have to lose that moment? If she crashes after this, then he likely wouldn’t know she got hit. I like idea, but don’t yet see a way to execute it! Overall, with Finn / Rose crash, I just can’t watch the movie with this included, because it’s so incredibly dangerous my brain rejects that Rose (or anyone) would do that. I realize it’s a movie, and there’s probably more improbable things that happen, but I feel cheated when the stakes are so low that characters can get away with stuff like this. Thank you again for the feedback! Definitely some stuff to think about and see what I can do! Here’s my train of thought with the Rose getting shot down idea. During the skimmer approach, a few skimmers get shot down by AT-ATs. We get shots of the AT-ATs, CU shots of Resistance pilots, then wider shots of the skimmers getting shot down. We also have shots of Poe reacting to the losses, which makes him decide to turn back. Basically, I was thinking replacing one of the Resistance pilot close-ups with a close-up shot of Rose, to imply she got shot down. After her skimmer gets shot down, it cuts back to Poe and we hear Finn shout “Rose!” over the comms. When Poe decides to turn back, people could infer Finn doesn’t want to give up also because he doesn’t want Rose’s possible death to be in vain, and if she is still alive, he wants to be able to give her a chance. One could have it where Poe is the one protesting when Finn raises his mic up instead of Rose. Just take a line of his from that moment and cut it short, or just him simply saying, “Finn!” I think one could just trim around Rose when needed. Finn abandons his crashed skimmer. Resistance reaction shots of base shaking. You would need to cut those shots out of the initial moments of Finn’s sacrifice run, and also replace the sound since that sacrifice music swell already begins by that point. The pros to keep the moment is that, one, it is a character moment for Rose and Finn, you could keep the kiss and it seems more tragic than weird since Rose didn’t cause Finn to crash in this scenario, and you also can see the door actually get destroyed, which you lose by cutting this moment. At this point the heroes have tried everything they can and all seems lost. Also, you could possibly use a 4K version of the “skimmers crashing into each other” shot and crop it to help hide the fact that it is two skimmers instead of one. But like I’ve said, I think you can still go with this idea and still cut Finn reaching Rose’s speeder. Heck, if you had to cut that, you could also cut Finn getting out of his skimmer. That way we don’t know if Rose OR Finn are dead until Luke shows up, and hope begins returning. Definitely not trying to tell you what to do, but I do think this is a moment that a lot of people have issues with, and it is interesting to see how it can be edited. I just would like to be able to retain as much of the movie as possible, since the more one cuts, the less things makes sense, like Rose being missing for the last ten minutes of the film. Anyway, just giving you some stuff to think about! I’ll probably try all of this myself at some point too. In the meantime, I’ll keep an eye out of any BB-8 shots that might be useful. That is beautifully laid out. I’ll have to think about it more but the idea makes a lot of sense! I’m not sure how any of Finn’s dialogue would work when he gets to Rose (“Why would you do that? I was almost there. Why would you stop me?”), so might be best just to cut it when he gets to her, and next see them when he drags her into base. This would mean no kiss, and no door being destroyed, unfortunately. For BB-8, I think I might have found a shot to try, but please feel free to pass along if you see one! Here’s a really rough cut of that idea I did quickly, just to see what it might look like. May or may not work, but gotta at least try it to see how if it even could work. I think the geography of the scene doesn’t allow for this idea to fully work. There really needs to be a definitive shot of Rose getting shot down, and closer to the weapon. As it is, Finn quickly runs right to her even though they’re supposed to be really far apart in this idea. Rewatching the original scene, I had a rather different idea. The main problem with the scene for me is how Finn is clearly on a kamikaze mission, and therefore believes that ramming his ship bodily into the weapon has at least a chance of working. When Rose stops him, the undeniable fact is that Rose has wiped out any chance of stopping the weapon before it fires, and risked both of their lives to do it. My idea is that you could edit the scene so that the implication is that the speeders must use their weapons to destroy the laser, and when it begins to open it will render their weapons inoperative. To do this, have the ships getting picked off and then cut to Poe deciding against the attack. He orders the retreat, but Finn is still gunning for the weapon. He says ‘All craft, pull away!’ (no ‘suicide run’). But then Finn asks ‘What?’ as if his comm is malfunctioning. ‘Retreat, Finn, that’s an order!’ But all Finn hears is static. He doesn’t see the other craft pulling away, and pushes his defective comm up. Rose shouts at him, but he’s clearly not receiving her. He goes into the beam and his weapons crumple, but he again doesn’t notice, and doesn’t close his eyes as he approaches the weapon. Then Rose slams into him and the scene ends as normal. RogueLeader, that’s an impressive rough cut, and works a lot closer than I thought it would. Great job! I agree with NeverarGreat about the geography between Finn and Rose. I think there would have to be more time between the Finn shots so it can seem like he ran a long distance. I also think Finn’s reaction stands out as a little understated. We don’t see his face, and he doesn’t sound quite emotional enough. Still way better than I thought it would be! NeverarGreat, I understand what you’re saying about trying to finesse the characer’s motives in the scene to make Rose’s actions make more sense. I just have trouble with the idea that crashing into your friend at that speed and angle can ever be seen as “saving” him. Rose crashes, which may be possible along the lines of what RogueLeager put together. What I have currently: after yelling “Finn don’t do this”, we don’t see Rose again until the Millenium Falcon. It’s odd, but didn’t bother me when watching the movie in full. Yeah, maybe the at least the idea of her crashing could work if a better reaction from Finn could be found somehow. And you could still cut him getting to her, and the next time we see them he’s dragging her back into the base. This would at least preserve her being injured for the last ten minutes of the film. It is true a better reaction could work. You would pretty much need to remove Finn going to her from her crashed ship … it does take away from the Ram firing though. Also, at least for me, I still see two ships colliding into each other … so for a person like me who sees details … there would need to be someone editing frame by frame and removing Rose’s colliding skimmer. Yeah, that is an issue and would’ve been hard to get away with on the big screen. Like I’ve suggested, maybe getting a 4K version of that shot and cropping it so one of the skimmers fly off screen early on would make it so brief that it would be hard to notice that it wasn’t just the other half of Finn’s ship. The rotoscoping is very rough, and I just threw on some sound effects that I could quickly find, but let me know whether you think the idea could work! I think/hope that this change combined with the Finn/Rose deleted scene could be enough to cut Phasma fight and BB8 in walker without the scene feeling incomplete. The scene would now have urgency AND resolution. That’s actually pretty convincing. The colors are a little off in the close up, but I think it’s pretty seamless in the wide shot. You’d have to be really looking to spot any problems. Hmmm, not bad. The first shot the proportions seem off, like he is too small for the scene. I will say the zoomed out scene is much better. I would probably take him off the close up and just have him make that beeping sound at the beginning of the zoom out scene. That may work better. The next thing to do is to clean up the Fin/Rose deleted scene. If you watch it, look at the background in the shuttle. It is unfortuantley an unfinished scene in where the background effects for the shuttle interior is a bit rough. Man, that looks pretty good! Some touching up and resizing could help as others suggested, but I think this proves it can definitely work. And jarbear, I went back watched that deleted scene a few times and I’m still not really seeing what you mean by rough effects. There isn’t a lot in the background, just a dark wall and a console, but I’m not seeing what makes it look rough. Sorry, it must be going over my head. Some people call them Force Ghosts. I call them Midichlorian Swarms. Granted, it could be my eyes but it looks like the panels on the sides of the ship (either looking at Rose or Finn) it appears to be digitally inserted but not cleaned up. I will need to relook at them on the bonus disk to make sure it’s not just me on the computer screen. But looking at videos online, the “side background” seems to be lower rez and not polished. Keep in mind, the rotoscoping of BB-8 itself is still rough. I want to see if the compositing can work with lighting, scale, and positioning before I go ahead and rotoscope properly in After Effects (or mocha). Jarbear, with the deleted scene, I actually think the lack of reflective lighting and debris in the first and last shot is what stands out to me. There’s fire and explosions everywhere around them and it doesn’t seem to reflect that in the cockpit scenes. Although, I suppose everything exploding might all be behind them? The side panels don’t bother me much, though. That all looks very good! One thing I’d suggest is removing the shot of the planet, since it probably wouldn’t be in view as they were flying away from the Supremacy, and there would also be a lot of fire and debris still to clear. Either that or show the single shot of the ship leaving the exploding hangar, then have the entire deleted scene without a cut back to the ship still exiting the debris. You could instead just show the end of the shot where it slowly zooms in on the throne room section. Thanks for all of the good feedback! NeverarGreat, I agree the last shot of Crait is a little empty, so one of the cuts you suggested would make sense. I’ll take another look at that! Addressing NeverarGreat’s comment, I tried cutting the planet shot from the deleted scene. Unfortunately, the music edit was rather abrupt going from Rose smiling to the 2nd fiery exterior. So I tried something different. I actually liked the way the ship left the hangar (which I’ll call Exterior A) and cut to the wide shot of it flying out of the debris (Exterior B) in the theatrical version. The music was good and so was the visual flow. The way it’s cut in the deleted scene is to use Exterior A and B to bookend the interior shuttle stuff. To me it cuts way too fast from Exterior A to the interior with Finn and Rose, and is awkward at the end when it cuts back to Exterior B because the explosions and debris don’t match the interiors. Instead, I kept the theatrical music and flow of the two exteriors as it was theatrically, and put the Finn/Rose shuttle scene after. It feels like the right timing to me, but I’m wondering how it sits with others! Yeah man, I think this works really well!